A team of marine scientists have just returned from a voyage with samples of rare animals and more than 10 possible new species in a trip which they say has revolutionized their thinking about deep-sea life in the Atlantic Ocean. One group of creatures they observed — and captured — during their six weeks in the Atlantic aboard the RRS James Cook is believed to be close to the missing evolutionary link between backboned and invertebrate animals. Scientists were completing the last leg of MAR-ECO — an international research programme, part of the Census of Marine Life, which is enhancing our understanding of the occurrence, distribution and ecology of animals along the Mid-Atlantic Ridge between Iceland and the Azores. During more than 300 hours of diving — using Isis the UK's deepest diving remotely operated vehicle (ROV) to depths of between 700m right down to 3,600m — researchers surveyed flat plains, cliff faces and slopes of the giant mountain range that divides the Atlantic Ocean into two halves, east and west. The research was focused in two areas — beneath the cold waters north of the Gulf Stream and the warmer waters to the south. Professor Monty Priede, Director of the University of Aberdeen's Oceanlab, said: "We were surprised at how different the animals were on either side of the ridge which is just tens of miles apart. "In the west the cliffs faced east and in the east the cliffs faced west. The terrain looked the same, mirror images of each other, but that is where the similarity ended. It seemed like we were in a scene from Alice Through the Looking Glass. "In the north-east, sea urchins were dominant on the flat plains and the cliffs were colourful and rich with sponges, corals and other life. "In the north-west, the cliffs were dull grey bare rock with much less life. 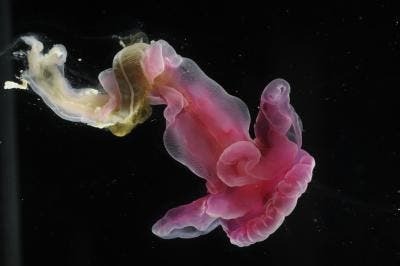 The north-west plains were the home of deep-sea enteropneust acorn worms. Only a few specimens, from the Pacific Ocean, were previously known to science. These worms are members of a little-known group of animals close to the missing link in evolution between backboned and invertebrate animals. The creatures were observed feeding and leaving characteristic spiral traces on the sea floor. They have no eyes, no obvious sense organs or brain but there is a head end, tail end and the primitive body plan of back-boned animals is established. One was observed showing rudimentary swimming behavour. By the end of the expedition three different species were discovered each with a different colour, pink, purple and white with distinctly different shapes." Using the remotely operated vehicle, high quality complete specimens of all three different-coloured species were captured and will be sent to specialists for further investigations. Sea cucumbers, or holothurians, normally seen crawling incredibly slowly over the flat abyssal plains of the ocean floor, were found on steep slopes, small ledges and rock faces of the underwater mountain range. Researchers were also surprised to see that they were very able and fast moving swimmers and unique video sequences were recorded of swimming holothurians. Professor Priede said: "This expedition has revolutionised our thinking about deep-sea life in the Atlantic Ocean. It shows that we cannot just study what lives around the edges of the ocean and ignore the vast array of animals living on the slopes and valleys in the middle of the Ocean. Dr Andrey Gebruk, Shirshov Institute, Moscow, said: "We were surprised how species, elsewhere considered rare, were found in abundance on the Mid Atlantic Ridge and we were finding new species up to the last minute of the last dive in the voyage." Dr Dan Jones, National Oceanography Centre, Southampton, surveyed over 50,000 square metres of sea floor in high definition detail and said: "We successfully completed one of the most detailed video surveys of the deep sea ever attempted. The Isis ROV with its cutting-edge technology gives us the potential to understand more and more of the mysterious deep sea environment."